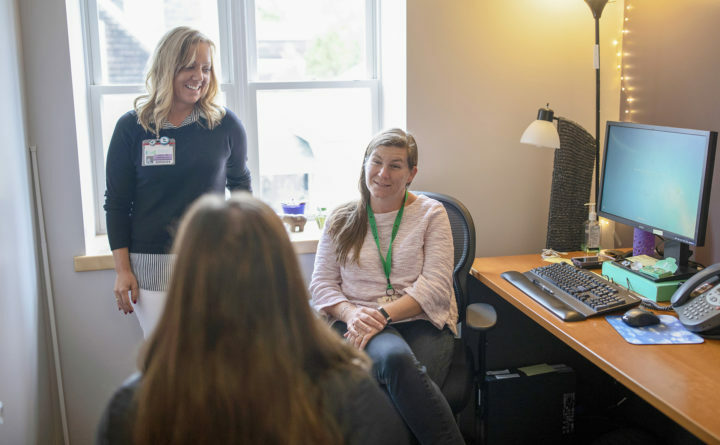 BAR HARBOR— Mount Desert Island Hospital will offer a new Cancer Patient Navigator Program that gives patients and their families an extra layer of support as they move through the healthcare system. The program, funded by a grant from the Maine Cancer Foundation, can assist patients through all phases of cancer care, from screenings and diagnosis to treatment and survivorship. “Any patient at any stage of their cancer diagnosis can benefit from the Cancer Patient Navigator Program because we give them the support they need for the best possible outcomes,” says Julie Pelletier, RN. As Cancer Patient Navigators, she and Heather Sinclair, LSW are available to meet with patients and their loved ones to help with insurance forms and challenges, assist with getting questions answered, coordinate care between medical providers, provide education about diagnosis and treatment plans and connect patients with resources that will help remove barriers to their care. “Barriers to care can include uncertainty about treatment, medications and symptom management, as well as financial, transportation and housing challenges,” says Sinclair. While both Pelletier and Sinclair work together to assist patients, each has their own area of focus. As a Registered Nurse and Cancer Patient Navigator, Pelletier can provide disease and treatment education, help answer medication questions, help coordinate care, and offer nutritional and symptom management recommendations and emotional support to patients and their families. As a Social Worker and Cancer Patient Navigator, Sinclair can help reduce barriers to care by connecting patients and their families to community resources such as transportation, housing assistance, financial assistance and other support groups. She can also help optimize access to financial resources to assist with treatment-related costs, including prescriptions. Patients interested in participating in the program can request a referral through their MDI Hospital primary care provider. For more information about the program, please call 288-5082, ext. 1305.